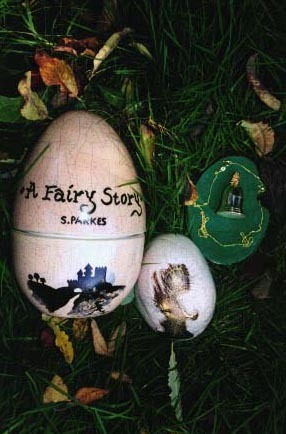 A Fairy Story was written by club member Stephen Parkes in 1997 and was available by post and on the Internet to club members and non-members alike. 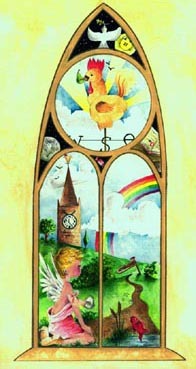 The treasure hunt consisted of a watercolour picture and story in poem style, each containing clues that would lead the reader to a location in mainland Great Britain. At this location lay hidden a container with a sheet of paper and a code, which when cracked using the story sheet, would lead to the main casket containing the Fairy Story treasure. The treasure is a silver hallmarked bell container adorned with a gold fairy on top, inside which there was is 9ct gold necklace. The bell is housed inside a small egg shaped crackle casket painted in 9ct gold. This egg was housed inside a larger speckled egg and buried below ground. The main red herring was uncovered in short order, but the main prize remained buried until Martin Dennett, armed with an extra clue released on the club website, set out for Harston, Cambridgeshire on 28 April 2000, where he uncovered a further clue and eventually, the prize. The full hunt, extra clue, a review by the author and full solution are reproduced below. The idea for A Fairy Story originally started with the idea for a book. It would contain 10 buried items that would be scattered about the British Isles, each puzzle would be accompanied by 10 paintings containing clues. I got as far as writing the 10 puzzles and painting two of the pictures, one of which ended up being A Fairy Story. I didn't expect when I released it nearly three years ago it to last more than a few months. Having the puzzle and picture, all that was left to do was choose a relevant treasure and construct a casket to bury it in. The treasure had to be something to do with a fairy, and so I began my own personal hunt for something to place into the ground. It was whilst on a trip with a friend to London that I eventually found what I thought was the perfect item, a silver bell with a gold fairy mounted on the top. I dully entered the shop and purchased the bell. All that remained was to make the casket and bury it at a secret location. The casket seemed the easiest of all, having been a ceramic technician at a local College for several years I had the knowledge to make my own. I decided to use the mould that I created for the Armchair Treasure Hunt Club hunt Dragonslayer. I filled the mould and waited for the clay to take shape. When the casket was finally finished, I decided to make another casket to sit inside this outer casket to give the bell a double layer of protection. I created a smaller egg mould and filled it with porcelain clay. Next I carved the fairy from the illustration on the top and popped them into the kiln to be fired. I decided on a crackle glaze for the interior casket and a speckle for the exterior one. With this done all that remained was to paint the interior casket with 18ct gold enamel. Now to do my favourite bit - the burial! I had decided to create a small pot with a code in to be hidden at the location as a security measure incase it was found by accident. It turned out later in the year during a visit to check the location that the casket had gone! I returned home, checked the answerphone, emails & post - no word...hmm. I waited a week to allow for the person contacting me, no one did. I returned the following week and replaced the casket. This casket disappeared too a year later, now I was beginning to get very puzzled. With a third casket in place things seemed to stop, and it is still there to date. Anyway, back to the story? Early on the chosen morning, just after the cockerel signalled the arrival of early morning I stumbled out of my bed bleary-eyed. Once we arrived at the location I started to dig the hole for the casket to go into, with my father as a lookout. Once done we returned to the car post haste, and started on the journey back home. With the puzzle now ready I put it onto my web pages, along with an address for people to send and obtain a printed & laminated copy. After a few days I was dogged with envelopes requesting copies, and so began to send out the puzzle - it had begun! It wasn't long before I received my first email solution, which in the light of day turned out to be the solution to the red herring that I had buried at a trig pillar. Several people either wrote emailed or telephoned my during the first few months to say they were going to the trig. Anne Denham, Dave Lyndon & Sally Hickling all visited the spot and retrieved a red herring brooch that I had hidden there, well done to you all. Once people had worked out the red herring, they began to work on the main part of the hunt and I began to receive some very interesting ideas and theories. It is amazing to see people pick away at a puzzle and read their ideas. After about a year of emails, emails began to slow down until I was receiving nothing. I decided to release an extra clue to help those stumped by the riddle. It didn't help - people actually thought it made the puzzle more difficult!!! To date the puzzle remains unsolved and the treasure remains hidden, and as for the solution I'm keeping that a closely guarded secret until it is solved by someone reading this article. In Repton, there is a trig pillar on Askew Hill. This is where I buried five small Red Herring badges. These were found by amongst others: Anne Denham, Sally Hickling and David Lyndon. The main solution to A Fairy Story was solved by using the round porthole like segment of the Fairy Story picture that contained a cockerel with a pear in it's mouth. This suggested that you were looking for 'pairs' from the painting. Several objects pictured contained double letter pairs. Knowing which to use was another puzzle, just ONE should have been taken from each segment of the painting, apart from the segment with the Red Herring depicted in it. This gave you six pairs of pictures which linked with words in the text. Six was indicated by the rainbow having one colour missing. So we now have our six numbers all that is left to find are the two letters that precede a six figure grid reference. This could be found by again using the periodic table. The clock on the church in the illustration had a small 2 above the number nine, this is how we write nine squared. Nine squared is 81. 81 in the periodic table is Thallium. Thallium's atomic letters are TL. So now we have our full six figure grid reference. This led to a stone (14lb = 1 stone) obelisk in the village of Little Shelford in Cambridgeshire. Hidden at the front left corner was the small casket with the code inside that led to the larger treasure casket at the nearby village of Harston.